Last week 2 older women said to our group of awesome lady runners, "When you're 67, only one of you will be running". Seriously? I don't get why they thought they had share this. I think this will just make us work harder to prove them absolutely wrong. When we saw them today I totally wanted to push them off the path. Does that make me a bad person? Anyway, onto some better news. 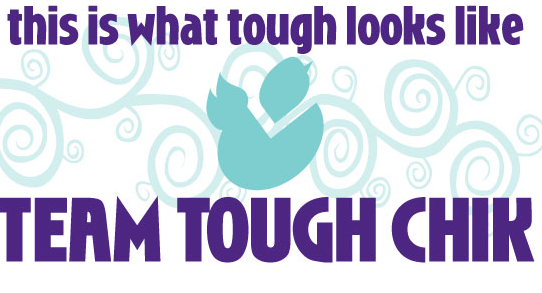 The awesome ladies at Tough Chik have come up with something absolutely outstanding – Team Tough Chik! This team is for every woman who wants to race in any capacity – from mud runs to Ironmans, to 5ks to Century fun rides. I know they are bloggers, but you don't have to be a blogger to join. 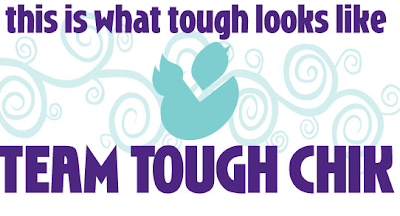 If you choose to join, go here to sign up, then check out the Team Tough Chik packages. I am absolutely loving the Run/Active Packages but I am also considering the Triathlon Packages since I’m planning on completing my 1st tri in 2012. I just don’t know which one I want. Decisions, decisions. I thought it was hilarious when Stacy gave them the finger! It makes my heart so happy to see Team Tough Chik and to see so many Maine girls!! I think that you would've been entirely justified if you pushed the old biddies off the path! I am making a silent promise to myself to never get that cranky in my old age!